This is just a quick little project that has done double duty for me in the way of both home decor and DIY gifting. I love it because it’s super quick and easy and can be customized to any gift or decor scheme, making it a perfect addition to a diaper cake to later be used in a nursery or as part of a gift basket to later be displayed in the recipient’s home! Any crafting enthusiast will most likely be familiar with mod podge and it’s seemingly limitless crafting applications. Personally I have used it as a sealer and glue as well as a top coat to many of my projects. 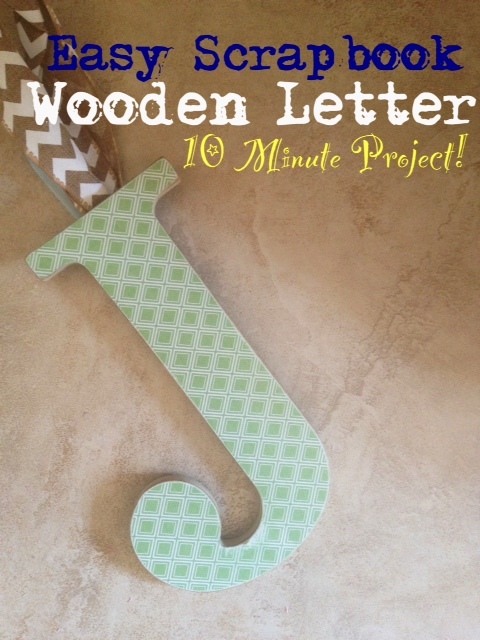 This particular project simply involved mod podging a piece of craft or scrapbook paper to a wooden letter and sanding the edges a bit. From start to finish it takes about 10 minutes (not including dry time)! When creating gifts I love adding little extras that don’t cost a lot to produce so this is the perfect addition to any gift (I’ll give some examples below), this particular project cost a little over $2.00. 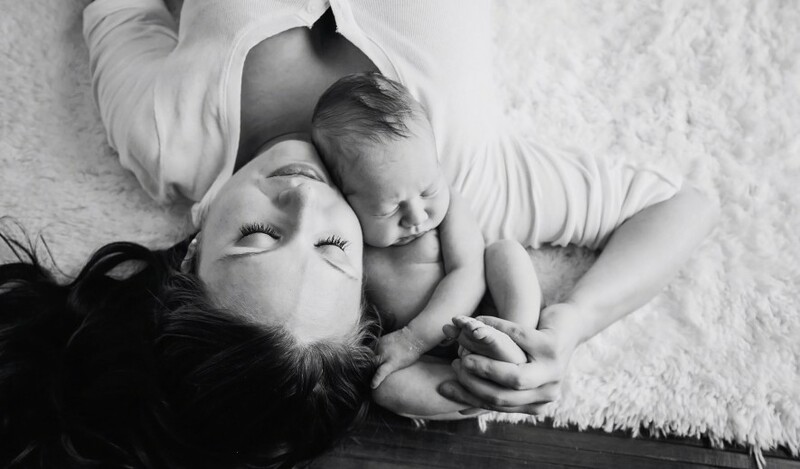 I hope this one makes it onto your next diaper cake or gift basket! 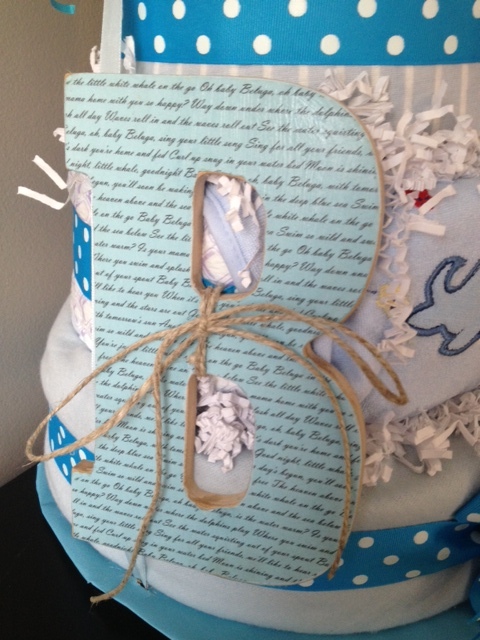 Step 1: Begin by laying your scrapbook paper print side up and placing your wooden letter right-side up on the paper. Using a pencil, trace around the letter. Step 2: Next, cut out the letter that you just traced, it does not need to be perfect, you will be sanding off any rough edges later in the process. Step 3: Using your foam brush, apply a generous coat of mod podge to the back of your scrapbook paper letter then carefully place it onto your wooden letter, adjusting it so that it lines up as closely as possible. Use your fingers to gently smooth the letter out, pressing the paper onto the wood. Use a tissue or paper towel to wipe any excess mod podge from the edges. Allow to dry, this will probably take about an hour but may be done in as little as 20 minutes. Be sure to wash out your brush so that you may reuse it later! Step 4: Once the letter has dried, use your foam brush to apply another coat of mod podge to the letter atop the scrapbook paper, this will seal it. Be sure to brush any clumps of mod podge off of the sides of the letters. Allow another hour or so of dry time. Step 5: Once the top coat has dried, use your sanding block to sand the edges of the letter (focusing on the top edges not the sides), this will give it a distressed look and really make it look like the paper is painted onto the letter. Once you are happy with your level of distressing on the edges you are finished! If you feel the need you can apply another coat of mod podge or if your paper has lifted at all on the edges you can apply some mod podge to those specific areas. This quick project helped me add a little something extra to the two gifts below! 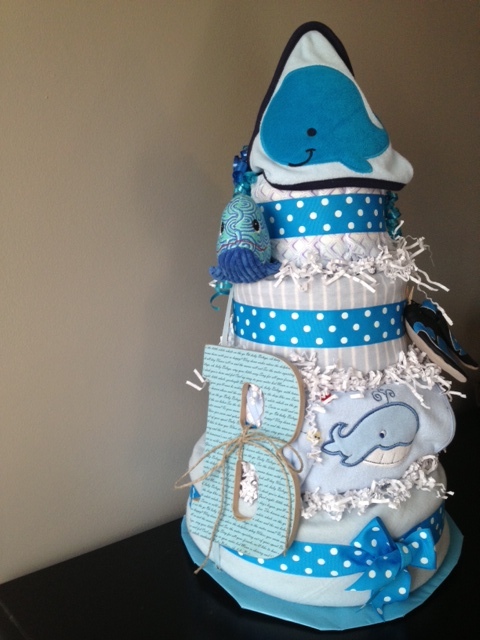 Here it is as part of my “Whale-of-a-Time” Diaper Cake. Since I forgot craft paper at the store that day I decided to improvise. Since baby Brian’s room is whale themed I simply printed the lyrics to “Baby Beluga” on some blue card stock that I already had. 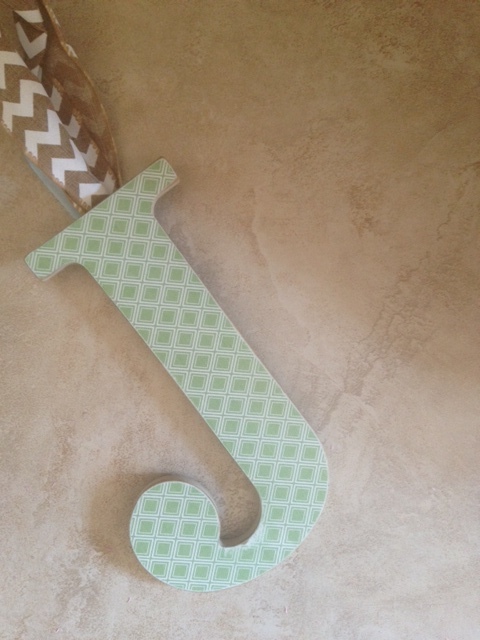 Here is a “J” I made for baby Jackson as part of my friend’s baby shower decor. 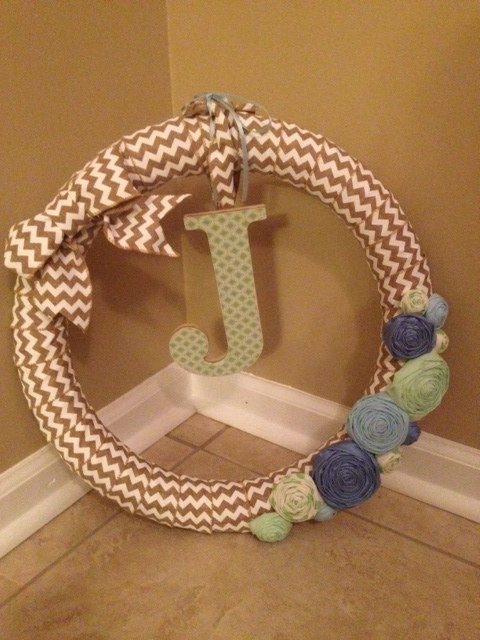 She had been a huge fan of my Spring Chevron Wreath so I made her one as a gift and at her shower we displayed it with the “J” on the door as part of the decor (I also made her a welcome burlap mini banner to go with it). Oh, and check out my tutorial for DIY fabric flowers if you like the ones on this wreath!